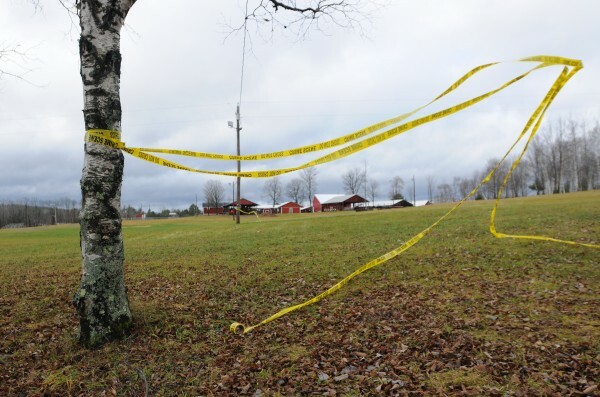 Crime scene tape flies in the wind at the Piscataquis Valley Fairgrounds on Wednesday, Nov. 30, 2011. Michael Curtis was gunned down by police at this location after shooting and killing Udo Schneider only moments earlier. BANGOR, Maine — The state has agreed to pay $225,000 to the relatives of a Sangerville man who was shot and killed by a Maine State Police trooper in order to settle a lawsuit filed against members of the law enforcement agency, according to the Maine attorney general’s office. Michael Scott Curtis, 46, left his Sangerville home after an argument with his wife on Nov. 29, 2011, and went to Hilltop Manor in Dover-Foxcroft, where his wife’s ex-husband, Udo Schneider, was working, according to authorities. Curtis shot Schneider, 53, to death and then traveled to the Piscataquis County Fairgrounds, where he eventually was shot and killed by Trooper Jon Brown. The attorney general’s office later determined Brown was justified in using deadly force against Curtis. Margaret Curtis, who died in January 2013, originally filed a notice of claim in May 2012 for wrongful death against the Maine State Police for fatally shooting her husband. Last July, Michael Curtis’ daughter Cassie Curtis and Margaret Curtis’ brother Mathias Poulin filed a civil lawsuit against Brown and Maine State Police Col. Robert Williams, Lt. Col. Raymond Bessette, Maj. Gary Wright, Dexter Police Chief Kevin Wintle, former Dexter Police Chief James Emerson and the town of Dexter. The lawsuit later was moved to U.S. District Court in Bangor. “The plaintiffs believe they have reached a fair and just settlement based on the unique facts and circumstances of this case,” the family’s attorney, Hunter Tzovarras of Bangor, said Wednesday in an email. “Trooper Brown’s use of deadly force against Michael Curtis was unreasonable under the Fourth Amendment. Once at the [Piscataquis County] Fairgrounds, Mr. Curtis did not threaten any officer and never tried to flee. A notice of settlement was filed last week but did not outline details. Assistant Attorney General William R. Fisher, who represented the Maine State Police, said late Tuesday that the lawsuit had been settled for $225,000. The settlement involved only the actions of Brown, Fisher said. As part of the settlement agreement, the allegations in the lawsuit concerning the Town of Dexter and its employees are expected to be dismissed. On July 9, 2012, the Maine attorney general’s office released a report in which it said the use of deadly force was justified against Michael Curtis. Maine Attorney General Janet Mills said Wednesday that the report and the settlement were not connected. “The attorney general is charged by law with investigating any use of deadly force by a law enforcement officer while acting in the performance of the officer’s duties,” she said in an email. “The sole purpose of the attorney general’s investigation is to determine whether self-defense or the defense of others, as defined by law, is reasonably generated by the facts so as to preclude criminal prosecution. “The review does not include whether there could be any civil liability, whether any administrative action is warranted, or whether the use of deadly force could have been averted,” she said. The Curtis settlement was the second time $225,000 has been paid to the relatives of a person shot and killed by a trooper, according to Fisher. In June 2000, the state agreed to pay Rhonda Searles of Porter that amount to settle a claim in connection with the death of her husband two years earlier. A lawsuit was never filed in that case. Trooper Richard Reaser II shot and killed Kevin Searles, 36, when the trooper came to investigate a hit-and-run accident in Kezar Falls that Searles had walked away from, according to a previously published report. Searles was shot twice in the chest after brandishing a knife at Reaser, who had entered the home through a shed in the back of the house. The events outlined in the report began the morning of Nov. 29, 2011, when Michael Curtis left his Sangerville home after having an argument with his wife. Curtis drove to Hilltop Manor in Dover-Foxcroft, a nursing facility, where he shot and killed Schneider of Sangerville. Schneider had two children with Margaret Curtis before they were divorced. Michael Curtis then drove to the Piscataquis Valley Fairgrounds, where police converged on him. Maine Drug Enforcement Agent David Wilson heard Curtis fire four shots while at the fairgrounds. According to the attorney general’s report on the incident, Wilson concluded that Curtis fired all four shots into the air. Sheriff Goggin had established contact with Curtis and was walking across the field unbeknownst to Trooper Brown, who yelled to Curtis to show his hands. When Curtis failed to do so, Brown fired three shots at Curtis with his rifle. The shots missed Curtis and struck his truck. Curtis fired another shot from his pistol into the air at that time, according to the attorney general’s report. Brown talked with other officers at the scene and then repositioned himself along with current Dexter Police Chief Kevin Wintle in a wooded area north of Curtis’ location. Goggin had resumed walking toward Curtis and was about 150 feet from him when Brown shot Curtis with his rifle. “At the time of the shot [that killed Curtis], Mr. Curtis was still armed and was looking in the direction of Sheriff Goggin,” states the attorney general’s report. Curtis was taken to a local hospital, where he died a short time later. According to the attorney general’s report, Curtis’ pistol had seven live rounds in it at the time of his death. It was determined that he had reloaded his gun after killing Schneider. Chief Medical Examiner Dr. Margaret Greenwald also determined that Curtis had a blood-alcohol content of 0.216 percent. Brown was placed on administrative leave after the shooting and later reinstated. There were 96 shootings involving police officers in Maine between 1995 and 2013 investigated by the attorney general’s office, 46 of which were fatal. Excluding a few open investigations, all the shootings have been ruled justified, according to data provided by the attorney general’s office in December.